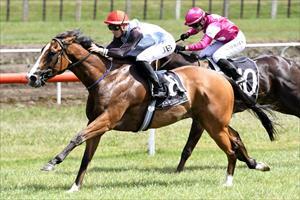 4.03 p.m. R8 3 Resurrect (6 g Shinko King – Errant, by Jungle Pocket) – Cameron Lammas; pulled up well from his second to Julius (Swiss Ace) in the Open 1200 metres on 4 August at Te Rapa, following a notable third on the same course prior. Dropping in grade for the $30,000 Rating 82 1200 metres, but up 4.5kgs in weight to carry 59.5. He won his Maiden here over 1200 metres on heavy going, registered a close second at his subsequent course attempt, and warrants respect in a small but select field. Fixed odds: $4.00 & $1.40. 4.38 p.m. R9 7 Sound Works (6 m Not a Single Doubt – Abu Zayan, by Mark of Esteem) – Cameron Lammas; was good through the line when seventh in the Rating 72 1400 metres on 4 August at Te Rapa, after running the fastest final 600m (35.8) when finishing third prior in the Rating 75 1400 metres on 14 July at Ruakaka. Drawn barrier three in the $25,000 Rating 72 1600 metres, she could threaten if appreciative of conditions at her first course attempt. Fixed odds: $5.50 & $1.70.